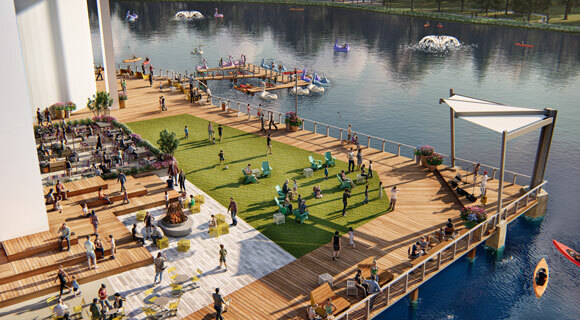 Fairfax developer Peterson Cos. is embarking on a long-term plan to further enhance its Rio Washingtonian Center in Gaithersburg that will add more than 1,000 homes in and around the shopping center as well as 500,000 square feet of new commercial uses such as office and hotels. If realized, the plan could cost $250 million, financed through a mix of debt and equity, and take 15 years to fully build out. Paul Weinschenk, president of Peterson’s retail division, told me his company’s plans for Rio are part of a “higher density future” for the 716,000-square-foot shopping center that is currently undergoing a $30 million facelift and the addition of new restaurants. Peterson is also planning reinvestments in other parts of the shopping center, which includes a 9-acre lakefront.